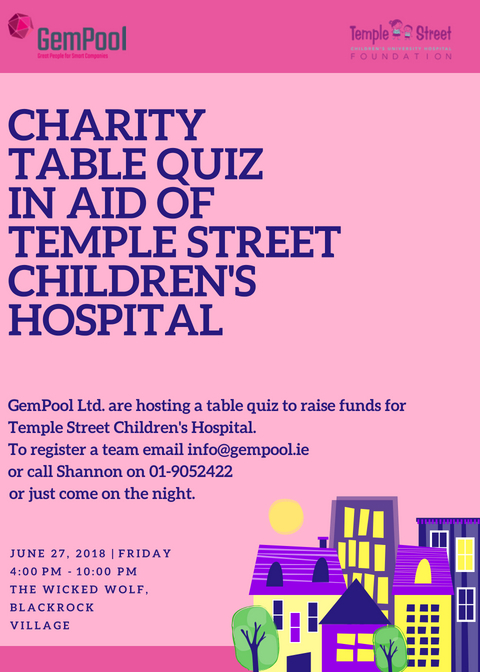 As most of you know GemPool are organising a charity event to raise funds for Temple Street Children’s Hospital. We could all agree that this is a very worthwhile cause. Temple Street cares for 150,000 children per year including over 45,000 who attend the Emergency Department. 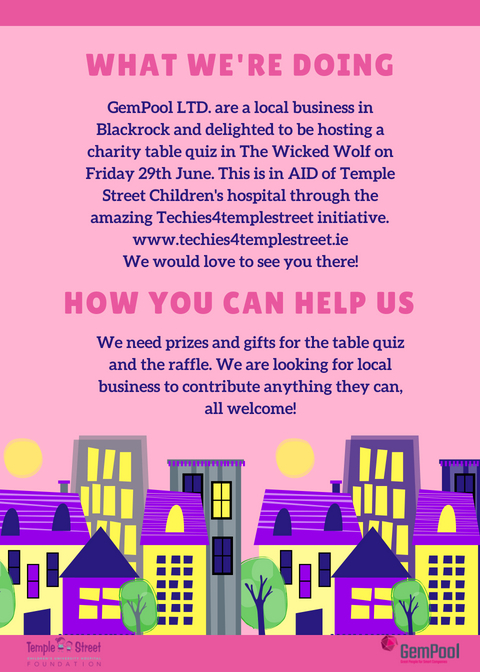 GemPool want to raise as much money as possible to contribute to the amazing work already being done at Temple Street Children’s Hospital. To do so, on the 29th June 2018, the GemPool team have organised a Cake Sale between 12:00pm – 2:00pm which will be held outside Blend Coffe (Blackrock Business Park, Block 3). Here, the GemPool staff will be selling some freshly baked, homemade cakes and pastries. The night of the 29th June 2018, we will also be hosting our very first Charity Quiz Night. The quiz will start on 7pm. We will ask you to be there for 6:30pm. This event will be held in The Wicked Wolf’s upstairs function room in Blackrock. There will be a private bar upstairs and raffle prizes to give away throughout the night. We are looking for teams of 4 to take part @ 10 per person. On behalf on the GemPool staff we look forward to seeing you on the 29TH June. If you have any questions or would like to get your team registered, feel free to call into us or contact us at any time.